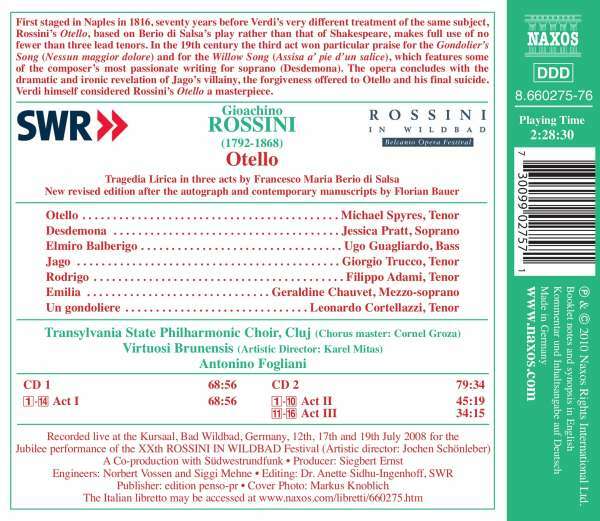 Der Artikel Gioacchino Rossini (1792-1868): Otello wurde in den Warenkorb gelegt. First staged in Naples in 1816, seventy years before Verdi's very different treatment of the same subject, Rossini's Otello, based on Berio di Salsa's play rather than that of Shakespeare, makes full use of no fewer than three lead tenors. In the 19th century the third act won particular praise for the Gondolier's Song (Nessun maggior dolore) and for the Willow Song (Assisa a' pie d'un salice), which features some of the composer's most passionate writing for soprano (Desdemona). The opera concludes with the dramatic and ironic revelation of Jago's villainy, the forgiveness offered to Otello and his final suicide. 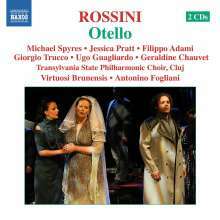 Verdi himself considered Rossini's Otello a masterpiece.